Families are God’s design for raising children. There is pain and loss in adoption. I really do not like that last sentence. It isn’t that I do not believe that it is true. I know it is true. I have three adopted children. I see their grief and loss. I am not going to lie, there were times early in the girls’ arrival that I was annoyed that they didn’t understand how much we loved them and how we wanted good for them. They were still looking back. It is taking me a long time to understand that. They still look back. They will probably always look back in some way. I have made peace with that. The girls have asked me what happened to their Indian mom. How do I explain something to them that I don’t even understand. I have been given very little information about their relinquishment. Kalindi’s memories are a bit jumbled. She told me some things when they first came when she was able to communicate it in English. It really doesn’t make sense and when I tried to check the story with her orphanage I was told that she was wrong. They said that all the kids talk about their stories and they get confused about what their story is. She also said that they watch movies and somehow parts of them end up in their story. I don’t know if we will ever know the truth. I have no truthful answer for that. I don’t know the real story. I can only make guesses. I always err on the side of giving their parents the benefit of the doubt. I am sure their mom made the best decision she could for her daughters. I guess the problem is trying to teach my girls to be content/happy where they are. I can’t change their past. This is their reality. How do I let them know that their past is precious and important and will always be a part of them – and that is good – and yet help them to embrace their life now? That the girls are working through all these feelings right now is probably very natural and very good for them. It is a healthy step they need to take in order to make peace with what their life is now. We had an interesting discussion in school today. We were talking about Jesus and that Joseph was only Jesus’ guardian, he was not his biological father. The concept we were learning was that Jesus is fully God and fully man. Not an easy concept! The girls asked questions because they weren’t sure they understood what I meant. Part of their questions were answered by talking about their biological parents in India (and that we are now their parents, but we are not flesh and blood related) and as we were talking Levi said, “I don’t have any parents in India.” The girls kind of giggled at that, but the truth of it is that Levi was an infant when he was relinquished. He does not remember having parents. I don’t think he even knew what he was missing. I told him that he did have a mom and a dad in India, but that I do not know who they are or anything about them. They did not give us any information and I am not sure if that is because they don’t want to or they don’t know anything. I said that I didn’t know why his parents could not take care of him, but that they took him to the nuns because they knew he would be taken care of there and that they would find him a family. He took all of that in very matter of factly. I suppose the truth of all that will have to sink in over time. 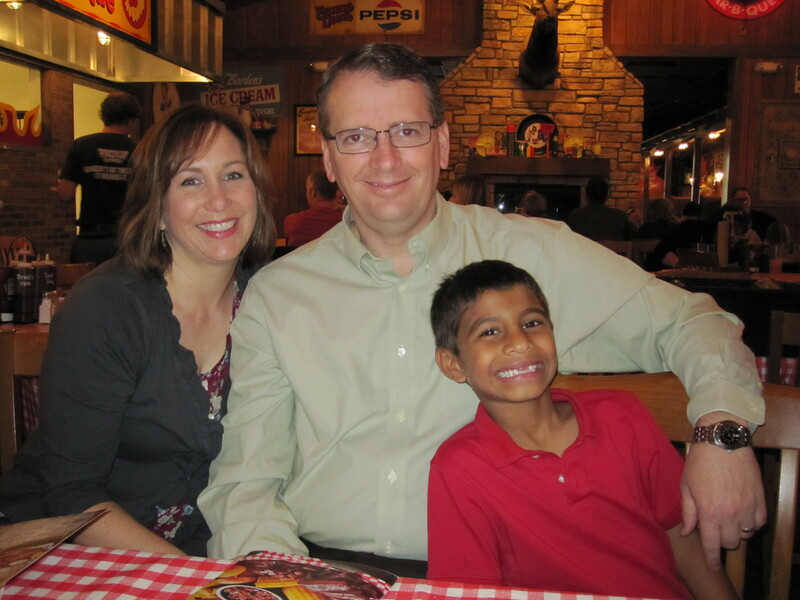 Tomorrow is Levi’s adoption finalization ceremony at the courthouse. The judge will officially sign his paperwork making him legally adopted in the U.S. We had to wait until we had two post placement visits with the social worker before we could file for adoption. All of the paperwork of the last two or so years is about to come to an end! Levi enjoying his birthday dinner out. Things are going really well. 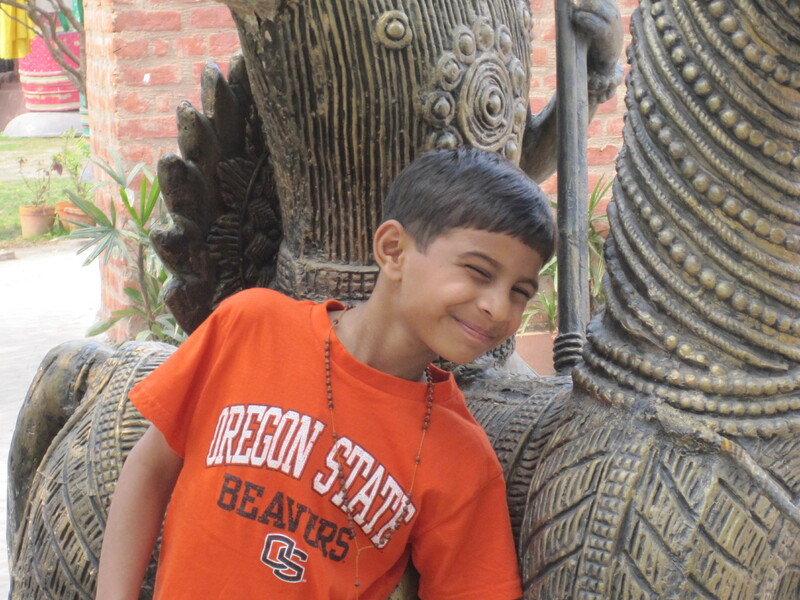 Levi Sangeet is a positive, happy boy and we are enjoying his laughter and his sense of humor. He has adjusted so well it has surprised me. You expect things to be tough at first. I think his personality, coupled with his readiness to be part of a family, mixed with his adoring sisters who dote on him has made his transition seamless. He really is funny and it is a pleasure to see him joke around and tease with his sisters and his Dad. It just seems like he has been with us for a lot longer than two weeks. I feel like God really answered our prayers about him being ready for a family. 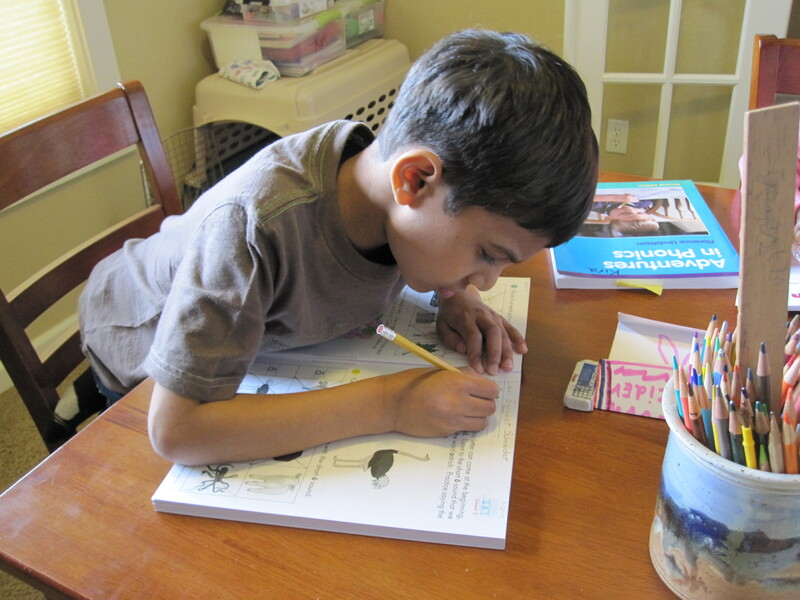 We have done school this week and he is very eager to work as well as loves to hear praise for how well he has done. And, he really is doing well. He has received a good education and I feel so lucky that I can just pick up where they were and continue. He knows his letters and their sounds, can count (and write) over thirty, he knows the days of the week and the months of the year. He knows his colors and quite a lot of vocabulary in English. We have not had any trouble communicating. I might say something and he will say, “Means?” when he doesn’t know the word I used or he can’t figure out the context. My one moment of sadness came when I thought of our son, Grant, and how his laugh would light up our home. I really miss him. Every day. But, when there is something wonderful happening I really wish he were here to share it with us. He would have made such a great big brother. One thing that is always hard when you have just been at an orphanage to pick up your child is all of those faces you see left behind. The need is so great. I will NOT tell you that adoption is easy and that there is no cost. It is hard. And, it will cost you – in every way you can imagine. But, it is a choice that will bless you and grow you in ways you cannot believe. If you are in a mind to consider adoption or know someone who is, please visit the waiting child page of our adoption agency, Journeys of the Heart. These are the kids that are older or have a special need of some sort. People aren’t lining up to adopt these kids. Their opportunities and futures are at best uncertain. At the very least, please pray for them. Pray for their health and their well-being, for caregivers who will show them love, for God to place a burden in hearts to consider adopting them. We are so blessed! Aren’t they beautiful? Inside and out!! We arrived home safely on Saturday, March 12. That arrival was in some doubt as we sat in our plane in Delhi, unable to leave the gate because one of the engines would not start. I went through all sorts of emotions during that wait. What would I do if we were delayed so long that we missed our connection in Amsterdam? Then came, what if we get asked to leave the plane and have to wait for another flight? Oh, and my favorite, what if that silly engine that won’t start does start and then dies when we are on our way – say – over Afghanistan? Honestly, my mind was racing. All of a sudden I remembered the lesson that God was working on with me from the previous day – be thankful for the situation I am in. I started to pray asking God to have His way and His will with this situation – no matter what. I said that I didn’t want my way, or to “get out of this”. I relaxed and not long after this heart decision the captain announced that the engine had started and we could be on our way. Because we had a four hour layover in Amsterdam, we did not miss our connection as many other people did on our flight. God is good! Levi Sangeet did so well on the trip. I was a little worried because he is energetic. He slept a good amount, but when he wasn’t sleeping he just kept busy with something in his seat. He was great! 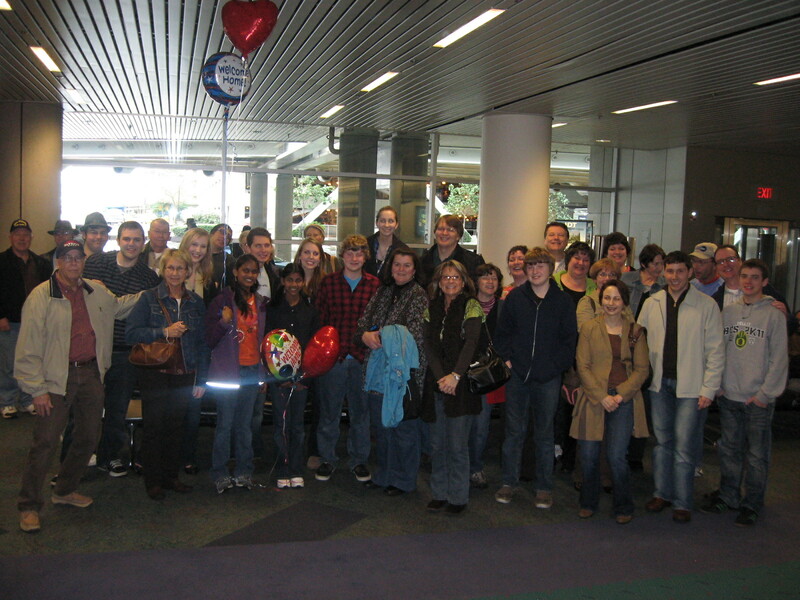 We arrived in Portland to about 45 family and friends to greet us at the airport. It was so amazing to see so many of the people who have loved and encouraged us through this process. Best of all, there were our three beautiful daughters who we missed terribly! 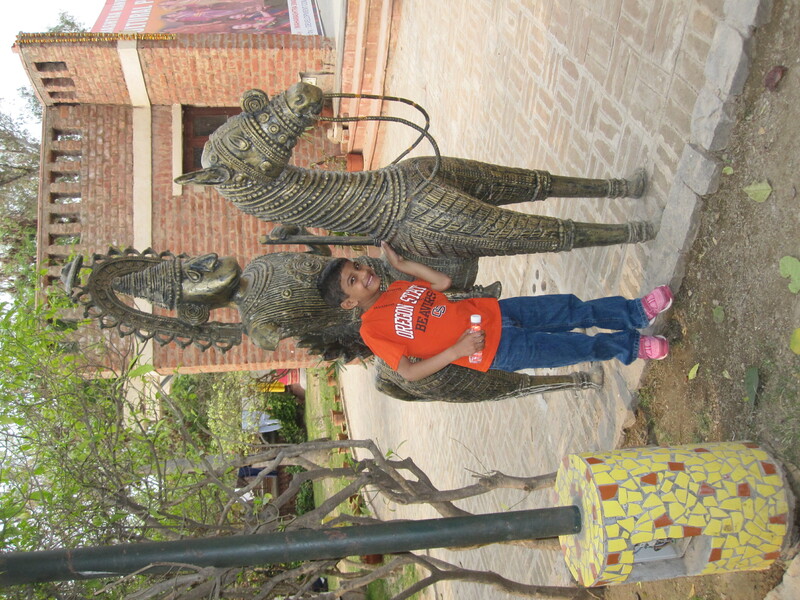 Levi Sangeet is a very outgoing and confident child. He was a little bit shy at the airport and then at church on Sunday, but he warms up quickly. He LOVES his sisters and they have been great with him. Kalindi and Kira are being super patient and willing to help him and play with him. I am sure he thinks he hit the jackpot. He has not exhibited any sign of grief or sadness at leaving India. Don’t get me wrong, I am sure he has some grief. But, it has been good to see him happy and enjoying himself. 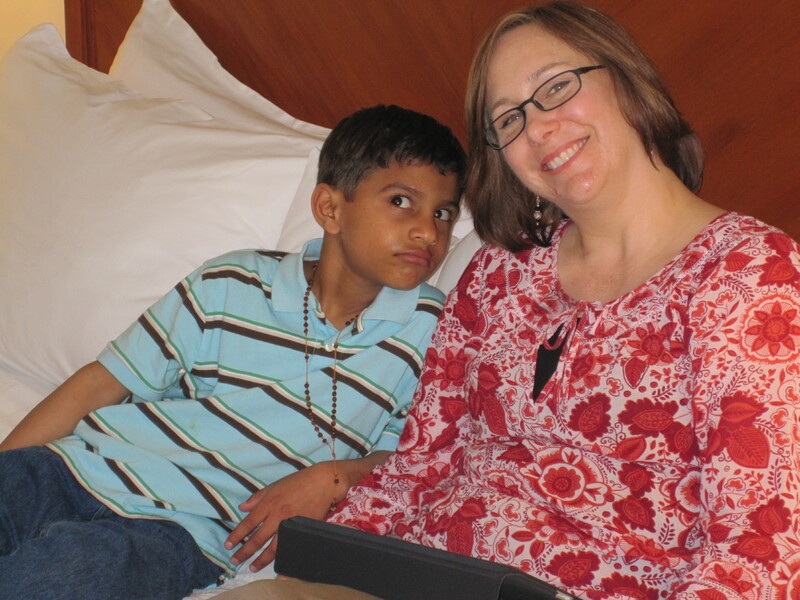 I didn’t mention when we were in India, we had to go back to the main orphanage where we had first picked Levi up. We were picking up a letter from the attorney there and also leaving a piece of paper they needed from us. He actually acted a bit worried and never relaxed while we were there. They kept wanting him to come and go to another room and see some kids, but he was very reluctant to leave us. I was worried that he was afraid we were changing our mind leaving him there. Poor kid. However, I took it as a good sign that he was happy as a clam and himself again as soon as we were in the car and headed to the hotel. He is showing affection to Kevin and I as well as his sisters. He is very curious and does not miss much. He is quick and I have a feeling he is going to give me, as his teacher, a run for my money! He is funny and happy and makes us all smile. I am seriously tired so I will say goodbye for now! I just really wanted to give you all a snapshot of how things are at our home. We appreciate your continued prayers as this is just the beginning! At 2:15 am Delhi time we got a phone call from our travel agent that everything has been taken care of. The airline changed the name on Levi’s ticket without any penalty or issues. We are praising the Lord! Before I went to bed I read a blog post of a friend who was reposting a post she had read. I happen to read the same blog she was citing so I know the back story of this gal. To get to the point, this young woman is a missionary in Uganda and she was telling the story of an older lady who has suffered much tragedy in her life including the recent violent death of her son. This woman was exuding the joy of the Lord even in immense grief and pain. It got me thinking how often we only want to praise God when things are going the way we want them to. Did I consider praising God for the mess we found we were in on Wednesday? No. My usual response is to ask God why He is allowing this in my life and to pray for it to go away. So, in retrospect I am now praising God for the trials this week. I am praising Him for allowing us a glimpse of his mercy and grace. I am thanking Him that He allowed us to be a part of an instance where He could show His power and sovereignty. I hope that I will learn to praise Him IN the trial instead of just when I am out of it. If you are interested in reading the entire blog post I mentioned, the original source web address is The Journey. Thank you all for your encouragement and prayers! USA here we come!!! Now, to try to get back to sleep! 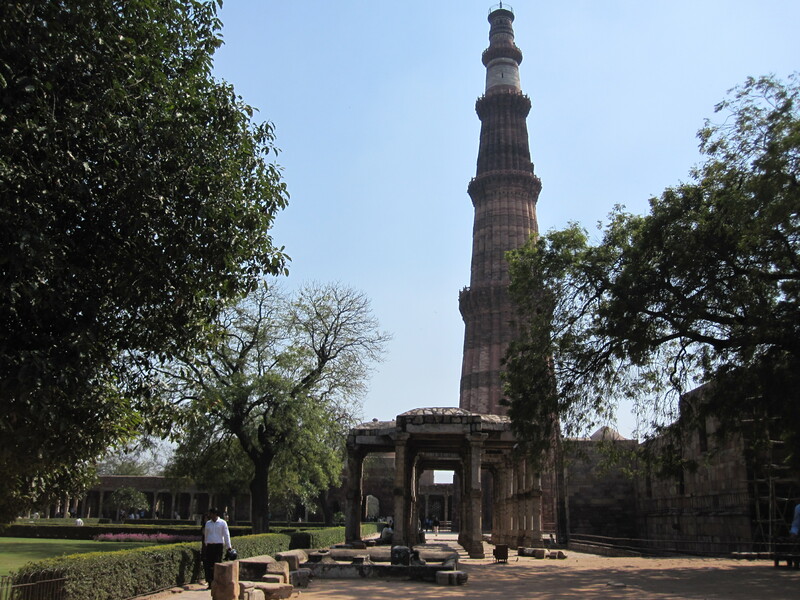 We went on a short sight seeing trip today to Qutab Minar. It was really interesting. I am glad we made it. We were not planning on going out today, but we had to drive back to the orphanage to pick up some corrected papers and a letter of explanation from the attorney. Kevin also needed to sign a letter for the lawyer stating that his name was wrong and to please apply for a corrected order. Before we left we pretty much packed everything as we were a bit worried that we had done too much shopping! It looks like everything will fit and hopefully be under weight. While Kevin was checking in for our flights he found out the Delta flight number for you who will be looking for us a PDX. It is DL 0179 coming from Amsterdam arriving at noon. We are very thankful for our good time in India and very anxious to get headed home. On the name front, he has been okay with being called Levi Sangeet. We went to bed last night not knowing what the airline’s decision would be on Sangeet’s plane ticket. We were told that his ticket would have to be cancelled (that they could not just change the name on the ticket) and that it was a full flight and there would be no way to purchase another ticket. I don’t know if that was because there is a waiting list or what. The travel agent was not being very helpful as all we wanted them to do was for them to call KLM and explain that we are adopting and we had no way of knowing that our last name would be on his passport. They finally did this and at 1:00 am (our time) Kevin was taking photos of our guardianship order and Sangeet’s passport as was requested by KLM. We still do not know what their decision is although we have checked in with the travel agent and they have not yet heard from KLM. Very frustrating! We aren’t completely sure, but are assuming everything will be okay with our legal documents not having Kevin’s name right. The attorney here is preparing a letter for us explaining the error in case we need that at the airport. We should be able to pick that up tomorrow. If they notice and say something then we will pull that out. Luckily, it is correct on one of the documents so that should help. Maybe they won’t even notice! Let’s all pray that way, okay. You might think we are freaking out about these things, but we are not. We are concerned and we are trying to do all that we can to be prepared, but we know this is in the Lord’s hands and there is very little control we have in making this all work out anyway. We do, however, appreciate your prayers. We talked with Sangeet last night about changing his name. He was not too happy about it at first. I explained some things to him about our thinking on it and asked him if Sangeet could be his name when he is in India and Levi could be his first name in America. He seemed like he could think about that. We will see what decision he comes to. We did ask if we could call him Sangeet Levi for now. He said that was okay. We had another discussion about his name this morning. Earlier in the day he was happy to be called Sangeet Levi, but later today he said, “Levi, no! Name Sangeet!”. Later today he was saying that we could call him Levi Sangeet. This is an evolving situation! :-). We did a lot of shopping today and drove by the Red Fort in the old part of Delhi. Kevin and I were laughing at what we are calling the “Delhi four-way stop”. You will never see this phenomenon in the U.S. The roads at this intersection without a traffic light held three to four lanes of traffic each way. (Another Delhi phenomena is that the lane lines are just there for decoration.) Picture a packed road, wall to wall vehicles, bikes, motorcycles, etc. Everyone is heading from every direction through the intersection at the same time – seriously at the SAME time. A mass of moving vehicles all honking their horns. It isn’t smooth and it is definitely not organized, but eventually everyone emerges on the other side. It is hilarious! Kevin said it was more like a four-way game of chicken. We went to the pool today after our shopping. Although it is plenty warm enough to swim, they do not heat the pool. It was a balmy 56 degrees. There was a portion of the pool where it was quite shallow for little kids. Sangeet walked around this area in the water. Then we got out and walked to another place and as we are watching him head for the side and we are saying, “No, wait!” he slipped right in (on purpose) and over his head. Luckily Kevin wasn’t too far away and grabbed him, but the look on his face before he went under was very scared. I hope he learned a lesson. We have been reinforcing the lesson of listening to us and asking before he barrels in to do something. Believe me, there is a lot of impulsive “barreling” going on! Tomorrow is our last day in India and we are quite ready to be heading home! 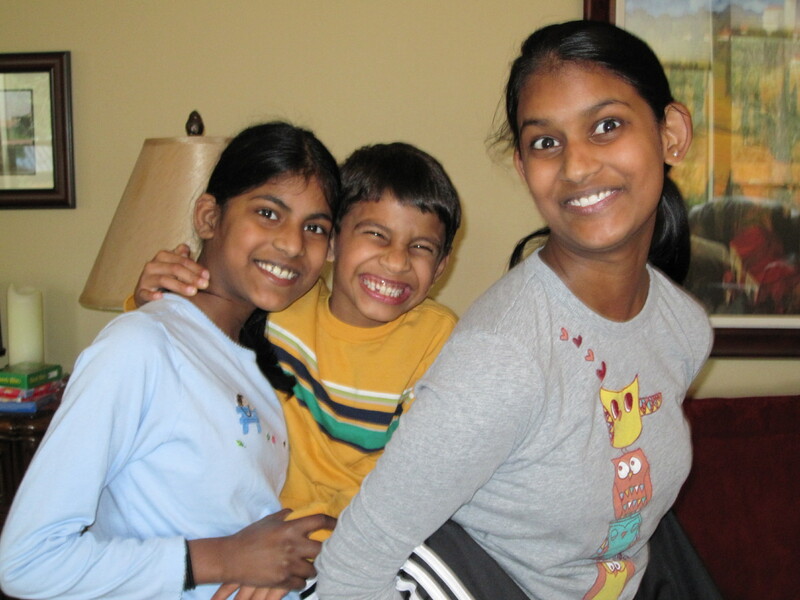 Sangeet is very anxious to meet his sisters and to be on the airplane. We’ll see how long that lasts. :-). That flight is not fun for me so I can imagine how hard it is on a kid. We will be leaving our hotel tomorrow night at 10:00 pm so that we have three hours for security and immigration. Last time we were not even through after three hours. I keep hoping that things have improved since three years ago. We have run into a bit of a legal snag. I won’t go into the details, but Kevin’s name is spelled wrong on almost every important document. We are unsure of the ramifications of this, but it could create an issue at the airport trying to leave. We have talked with the attorney through the Sisters and he said there is no way to get new documents before we need to leave. The judge who did our case has been transferred and the new judge is on leave. This will eventually need to be done, but we just do not know if the error could affect our being able to leave with Sangeet. There is also an issue with Sangeet’s plane ticket. When I reserved it I assumed he would not have a last name listed on his passport. With the girls they just put, NLN or LNU. They made his passport say Sangeet Schneider, which is nice, but it needs to match the ticket. We contacted the airline and they will not even talk to us because it was booked through a travel agent. We are trying to get the travel agent on the phone. Please pray for these situations. We know that the Lord is in control and we are trying to leave it in His hands. I don’t want to make more of this than it is. There is just too much we do not know. Today was a much better day if only for the sleep that we got! Lori J. commented on how tired we looked and boy, was she right! My goodness were we tired. We also had so much that we had to do and it was hard to process it all. I wish we had a good night’s sleep under our belts before we had met Levi, but it was what it was. And, honestly, it was pretty good. It is an odd thing meeting someone you feel like you know because of photos and thinking about praying about them for a long tiime. But, you really don’t know them. And, he has only known about us since Jan. 24. Last night after we had rested and all took a short nap in our room – I looked over at Levi sitting at the desk coloring and I saw a tear sliding down his face. There was nothing on his face to tell me that something was wrong. I got a tissue and wiped the tear and asked him if he was okay. He nodded his head. I went back to what I was doing and looked back to see a lot of tears. This time he broke down. It was hard to watch, but in all honesty it is a really good thing. It means that he is beginning to grieve. I was also really impressed that he could tell me what was wrong. He explained that he missed the Sisters (nuns at the orphanage) and wanted to see them. Actually, what he wanted was for me to call them – he had them write their phone numbers down for him! 🙂 Can you imagine a nun with a cell phone? Well, they do. I did call and told them that he was very sad and missing them and could they talk to him. I am afraid that all they told him was to stop crying – that it would be wrong to cry. I do not feel that way. In fact, we were able to visit there today – he had been taken to the main orphanage where we had picked him up so he needed to go back to his orphanage to say goodbye to the sisters who have taken care of him for the last few years and to his friends. He was so excited to arrive that he was telling the driver directions. He seriously knew how to get there from quite a ways away. This kid does not miss a thing! He is quite amazing with what he notices. He was literally bouncing around the place taking us to every room. He did look sad when we left and I told him that it was okay to be sad. He should feel sad. I also told him that it was okay to be happy about his new family and it was okay to be looking forward to a new life. Lori J. asked about his English. It isn’t great, but it is okay. He understands a lot and he can speak enough English to communicate what is important. He is like a sponge and will pick up the language in no time. We went shopping today and we had the same driver as yesterday. He is a very nice man and took to Levi right away. 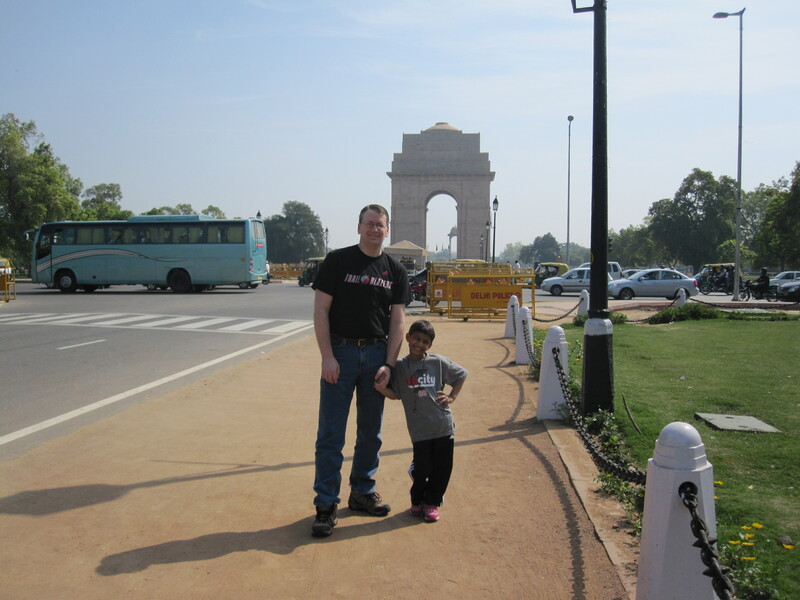 We stopped to take in the India Gate and the parliament buildings and take some photos. Our driver, Bisht, wanted us to take a photo of him with Levi. We went shopping at a small Emporium with several levels with different goods. Levi made friends in each level and had someone give him a bottle of coke, as well as offer him lunch. The whole staff was at the door waving and saying goodbye to him as we left. He tends to attract a crowd wherever we go. There are many behavioral things that we will need to address at home. Whenever we correct him and tell him not to do something Indian people always tell us, “Oh, don’t tell him no. It is okay.” I think that is the way they raise kids around here. Nothing too horrible – just normal kid stuff. And, yes, he is busy – active – whatever you want to call it. He can’t sit still for long without drumming on something or singing to himself all the while fidgeting. He will definitely liven up our home. Just consider this a warning to anyone who sits around us at church! He is very anxious to go home and meet his sisters. He has watched their little videos we took before we left of them saying hi and that they are looking forward to meeting him. 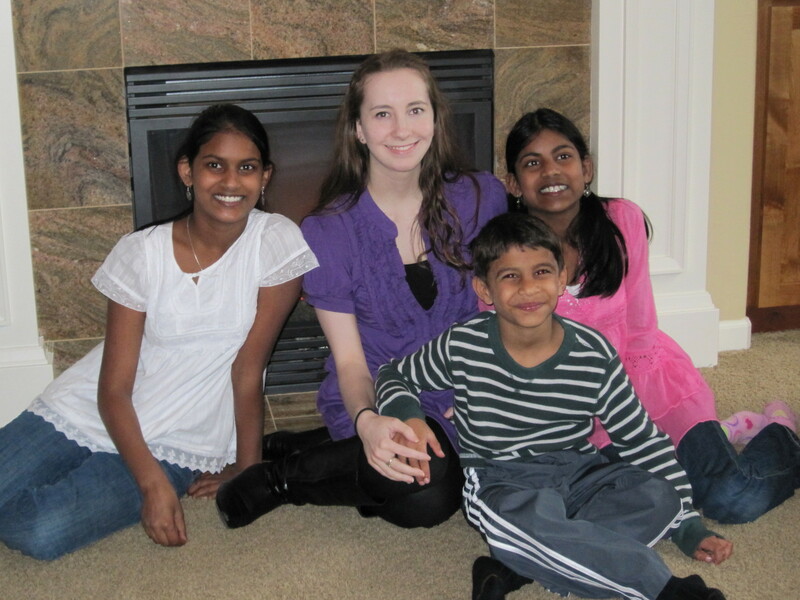 Kelsey, Kalindi, and Kira – Levi is very anxious to meet you!! When we said we were going to see the sisters today he got all excited and said, “Kelsey, Kalindi, and Kira? Go home airplane?” We had to explain what we meant and that we won’t be leaving for a few days. We have not talked with him about his name. We are thinking we will tomorrow, but we don’t want to rush it. We bought some fun things to bring home! Girls – you are going to LOVE what we bought you. We have plans to do more shopping and a little sight seeing. Our driver is very accomodating and knows how to get around this crazy city. Tomorrow we have to go back to the hospital to have Levi’s TB test site checked – nothing is showing – YEAH – and then back to the Embassy to hopefully complete that. 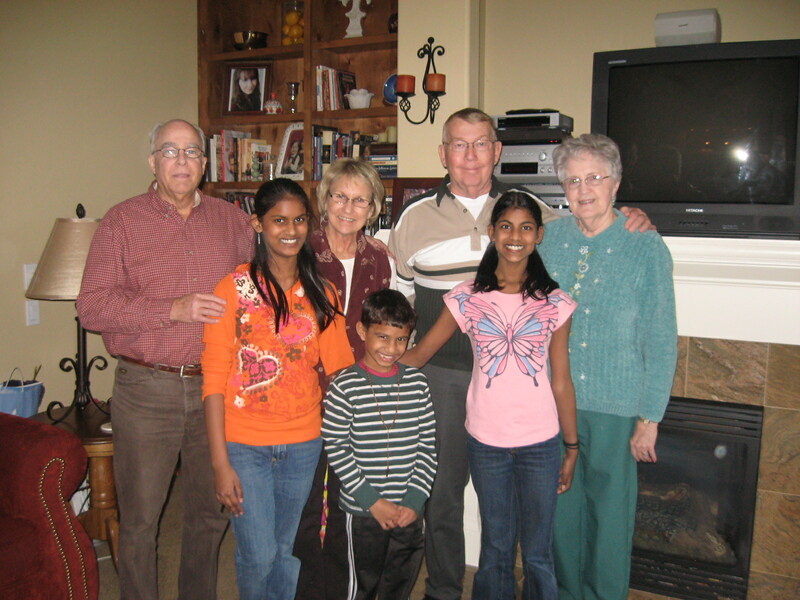 Our guide here, Madhu, who is helping us with the adoption formalities is great. We just follow her around and do what she says. It makes it quite easy. It would be a bit intimidating to do these things on our own. We plan to come back to the hotel tomorrow and just hang around here and swim and play. It is warm here – about 80 – just right and not humid. We are feeling very thankful for that! We love you all and thank you again for your notes and your prayers. We feel God with us and He has laid out our path. We know that He has or will equip us to do whatever lies ahead.